When your life is nothing but lucky, having a name as “Lucky” may seem like a joke. 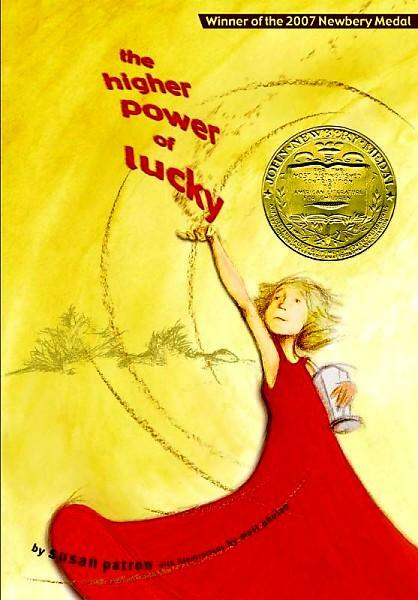 The Higher Power of Lucky by Susan Patron interestingly enough has been a challenged book for one word; “scrotum”. The protagonist is a 10 year old girl, and many find that word to be inappropriate for a tween (early-adolescent) regardless of it being basic human anatomy as it was used in proper context. Still, this heartwarming story, a 2007 Newberry Award recipient, gently engages its audience about topics that most 9-14 year olds are aware and curious about. Topics such as death, loss, abandonment, foster care, poverty, addiction, spiritual beliefs, runaways, insecurity, friendship, love, and even community. Lucky Trimble’s own name may seem ironic to her and even the reader may agree due to her many misfortunes. Lucky’s life is one of insecurities born from loss, abandonment, fear, poverty, and lack of communication. Through all of this, she displays considerable determination to ensure her own security by her survival kit (backpack for running away to test Brigitte, her legal guardian’s loyalty), her dreams of notoriety as a famous scientist, and eavesdropping on various 12-Step meetings in her quest for a “higher power” as she has heard many share in their testimonials of how their higher power saved their lives and gave them stability. This stability is what she desires most of all. She doesn’t want anything to interfere with her leaving her hometown, and her daily concern of her being given up to a foster care system and having to leave her dog HMS Beagle, Miles (5 year old cookie loving kid always wanting Lucky to tell him stories and read his favorite book Are You My Mother? ), and Lincoln (maybe future president and a member of the International Guild of Knot Tyers). Thankfully, Lucky does come to discover that Brigitte does not intend to leave her and is currently in the process of adopting her. And, also discovers her “higher power” is in fact the town of Hard Pan (same abbreviation as higher power) due to the love all of the other 42 inhabitants have for her as she realizes from their community effort to locate her when she runs away from home during a dust storm. The Higher Power of Lucky is the first book in the Hard Pan trilogy. It is an endearing realistic fiction story that many tweens may easily be able to identify with and cheer for and even cry for Lucky as the readers follows along with her daily life in this unique and quirky small town and poverty stricken community. For those who are aware of the different anonymous organizations such as Alcoholics Anonymous, Gamblers Anonymous, Overeaters Anonymous, and Smoking Anonymous will enjoy the humor as lucky cleans the patio between each group meeting. This story of hardship is less foreign than many may believe for children as much as it is for adults. Though categorized as juvenile fiction, the lessons taught and learned through Susan Patron’s inspiring novel can assist many through “real” tough times as well as provide much insight into the mind of a tween. If you enjoy The Higher Power of Lucky, then you will also enjoy The One and Only Ivan by Katherine Applegate, One Crazy Summer by Rita Williams-Garcia, When You Reach Me by Rebecca Stead, and Moon Over Manifest by Clare Vanderpool.